Chameleonmask is a telepresence system that shows a remote user’s face on the other user’s face. While most telepresence systems have been designed to provide a remote user’s existence with a teleoperated robot, the system uses a real human as a surrogate for another remote user. To do this, a surrogate user wears a mask-shaped display that shows a remote user’s live face, and a voice channel transmits a remote user’s voice. A surrogate user mimics a remote user by following the remote user’s directions. This design is based on our hypothesis assuming physical and social telepresence can be embodied by such a surrogate human who imitates the remote user. It also eliminates many difficulties of teleoperated robots wandering in the environment. Our pilot study confirmed that people could regard the masked person as a right person. 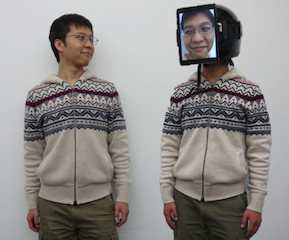 Kana Misawa, Jun Rekimoto, ChameleonMask: A Human Surrogate System with a Telepresence Face. Siggraph Asia’15: Emerging Technologies, Kobe, Japan, 2015.